Lauren, Conor (top right) and Morgan (bottom right) died in the crush at the St Patrick's day disco. THE FUNERALS OF the three teenagers who died in a crush ahead of a St Patrick’s Day disco in Tyrone will be held this Friday. 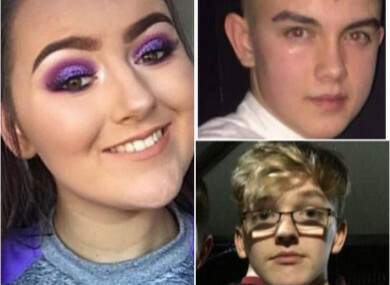 17-year-old Lauren Bullock, 16-year-old Connor Currie and 17-year-old Morgan Barnard were killed in the incident outside the Greenvale Hotel in Cookstown, Tyrone on Sunday night. The three teens will all be laid to rest this Friday in separate masses. Yesterday, detectives from the PSNI Major Investigation Team arrested two men aged 52 and 40 on suspicion of manslaughter. They were taken into custody for questioning. Detectives conducted a search of a house in Moneymore at the time and seized a number of items. The 52-year-old man who was arrested yesterday was then further arrested on suspicion of possession of a Class A drug with intent to supply. However, this evening, the PSNI’s Major Investigation Team said he was de-arrested on that suspicion. The PSNI are now urging parents to talk to their children and encourage them to come forward to tell their stories to police so they can “get an accurate picture of events that night”. Email “Funeral arrangements announced for victims of Tyrone nightclub tragedy ”. Feedback on “Funeral arrangements announced for victims of Tyrone nightclub tragedy ”.